Here at apt.Design we have a real love of books. When we are out and about we will always try to pop into a book shop to see what catches our eye. Last week we came across ” The Shopkeepers” published by Gestalten. We have an active role in retail architecture and are interested in what the future of the ‘shop’ will be for the retailer. 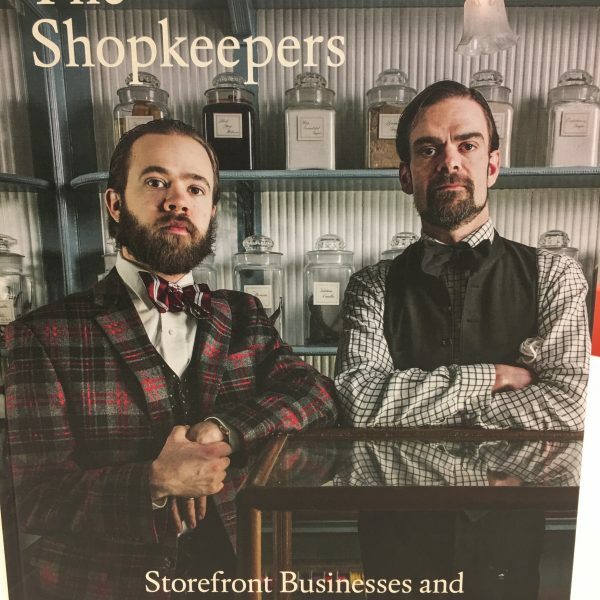 This book focuses on individual retailers who share the distinctive character and personalities of their owners who have adopted ways to encourage people to get off the computer and actually go shopping. The stores featured in the book are from all over the world and offer a mixed and eclectic range of products. We loved the section devoted to ‘Blom & Blom’ workshop and storefront in Amsterdam. 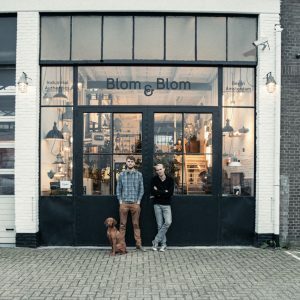 This store caught our eye for many reasons, one of which was the feature of the Hungarian Vizsla sat outside the shop- maybe we should bring our Zala to work too? We loved the inspired collection of salvaged industrial items that the brothers have lovingly restored and have displayed in their converted warehouse. They have maintained many of the buildings original features exposing brickwork, rafters, tiles and ironwork. 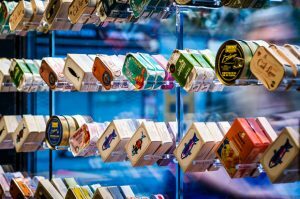 In complete contrast ‘tincan’ in London has created a micro eatery serving only tinned seafood. The window display is so inventive. Their wares are displayed in the most colourful, eye catching, exhibition like way creating intrigue to the passer by. Pen store in Stockholm is a beautiful example of retail minimalism. The multi purpose space is used as a gallery, shop and studio. It is a haven for designers, graphic artists and lovers of pens. You can test out the pens and the shop encourages interaction with their customers by inviting their favourite artists and illustrators to demonstrate what the pens can do. We think its great that the humble pen can still be appreciated in this way. 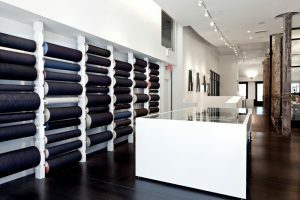 ‘3X1’ in New York has crafted an unconventional retail concept store devoted to Scott Morrison’s bespoke denim designs. We all own a pair of jeans and take them for granted but Scott has created a retail environment that captures the customers imagination in a completely different way. The customers have access to the factory watching their jeans being cut and sewn through huge glass walls which creates a personal relationship between the customer and the product. The company has the largest selection of selvedge denim in the world on display which makes for a truly unique shopping experience. Plus the building is gorgeous. ‘Tender Button’ New York city caught our eye too. It does what it says on the tin, committed to just selling buttons. The store has occupied the same spot on the Upper East Side for over 50 years and the storefront has a simple, elegant charm. The buttons are neatly displayed in boxes stacked right up to the ceiling offering the customer a real treat if buttons are your thing! OU-‘Original Unverpackt’ in Berlin is a supermarket where everything comes unwrapped. We love this idea and admire all the thought and planning that the owners would have experienced in order to carefully display their wares. 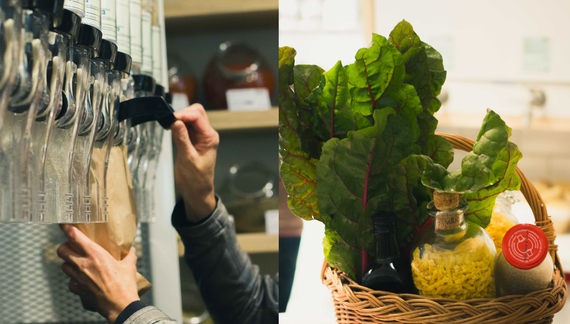 Their uncluttered approach results in a supermarket free of advertising thus simplifying the shopping experience. 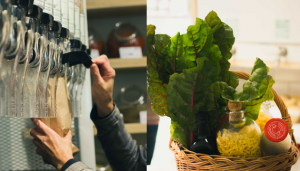 The owners Wolf and Glimbovski also run seminars for their customers to pass on their knowledge and hope that this waste free form of shopping will permeate to all aspects of our lives. These are just a small selection of the retailers featured in this book, there are many more. 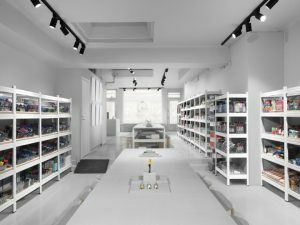 One thing that they do all share is a strong personal ethos and belief in their product which creates a truly personalised retail experience for the customer. The locations have been carefully selected and hope to nurture regular customers and create brand loyalty. All of these shops provoke an old fashioned excitement of the shopping experience where customers enjoy a personalised service and importantly have enjoyed spending their money.